For several summers, we have obtained a small number of painted lady butterfly caterpillars and watched them change into butterflies. It is always fascinating to see each caterpillar shape the chrysalis around itself and afterwards remain suspended, motionless, as if in death. Then there is the day when the chrysalis starts to vibrate, eventually shivering, as if impatient to be done with change. It shivers a long time, so much so that one fears it will fall off the branch. But the moment of emergence has always eluded us. We go to sleep, or go out of the house for some reason, and the next time we look at the container, we see — as if substituted by a magician’s sleight-of-hand — a magnificent butterly next to its empty bedchamber. The ancients often used the image of the caterpillar transformed into the butterfly to speak about the resurrection of the body. As the caterpillar, not known for beauty or dexterity, is wrapped in silk like the winding-sheets of burial, it seems that all life is extinguished. The coming forth of a far more beautiful creature, free of earth to soar in the skies, aptly tells us of the glory of the resurrected body. As the Preface for the Mass of the Dead says: For Thy faithful, life is not ended, but changed. Thoughts like this often occur to me on the strangely melancholy post-Christmas feast of the Holy Innocents. I say melancholy because, right after Christmas, we have a feast of unspeakable slaughter, bloodthirsty egotism, the ugly shadow of corrupt politics looming over the cradle of Bethlehem, the chill breath of the world against the cheek of humility. I cannot be the only one who winces when the Gospel passage is read out, and thinks of all the ways in which our world has still not let itself be redeemed, is still waging war against the Christ-child, is still scheming to suppress the King of kings. But then I remind myself why it is a feast and not a day of penance like January 22nd. 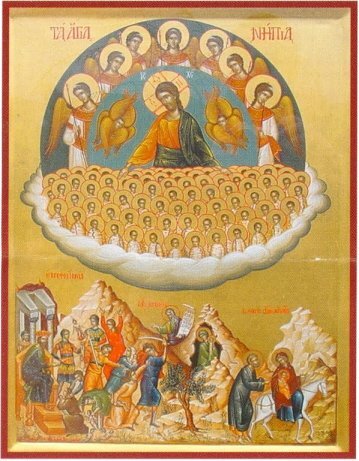 The Holy Innocents are true martyrs who stood in for Christ: they anticipate in their flesh the scourging, the nails, and the spear by which our salvation was wrought, and by which theirs was completed. What a triumphant victory, to have won without fighting, to have rushed ahead into the mystery of the Cross, without waiting for leave! By being circumcised into the covenant with Abraham, the Holy Innocents professed their faith in the coming Messiah who, indeed, had just come into the world. Because of this, they were able to greet Him when He harrowed hell. For it was meet that unfailed innocence should greet the sinless One. They were spared the bitter test of fallen human life, the risk of mortal sin, the all-too-real possibility of eternal damnation. We consider it a terrible tragedy when human life is cut short, and it always is, for us; but the Holy Innocents remind us that there is a higher vantage, a divine comedy, in which this life plays the part of a prelude to eternity. 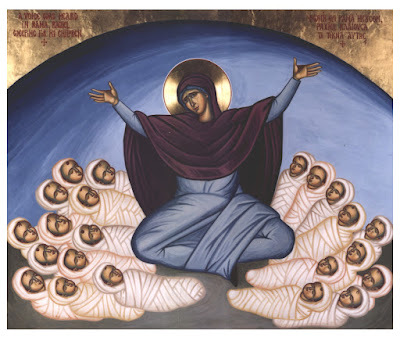 They rejoice forever in the vision of God’s glory, in the joyous dance of all the saints and angels; to them earthly life looks like a mere moment, as it will look to all of us. Washed in the blood of the Lamb, the Holy Innocents bask in the light of the beauty of Christ the Savior born in Bethlehem. The sacred liturgy immortalizes their mortal story. We know they are transformed in soul and will be resurrected in their mature bodies — as great a surprise to their mothers as ever a butterfly was, compared to the caterpillar.